Replaces a standard shock to improve your ride. Call 800-298-8924 to order Lippert Components accessories and parts part number LC283271 or order online at etrailer.com. Free expert support on all Lippert Components products. 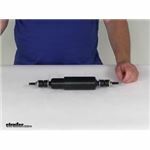 Guaranteed Lowest Price and Fastest Shipping for Lippert Components Standard Replacement Shock - Black. Accessories and Parts reviews from real customers. Replaces a standard shock to improve your ride. The Lippert Components standard replacement shock instantly improves your ride. Replacement shock helps absorb road shock and vibration for a more comfortable towing experience. Today we're going to take a look at the Lippert Components black standard replacement shock. This Lippert component shock will instantly improve your ride. It is an oiled filled shock. This is a replacement shock that will help absorb road shock and vibration. Give you a more comfortable towing experience. The part is one shock per package. It does include the mounting hardware which I've already installed onto the stud mount. It has a nice black enamel finish and the most important thing about it it's the measurement of the compressed length and the extended length. It's in the compressed position right now, so we're going to measure from here to here. Which is the compressed length. We put a ruler on that you can see is right at 7 1/2 inches. If we do the extended length, you pull it out all the way. Outside all the way in the same from here to here. The extended length on this is going to be right at 12 inches. That should do it for the review on the Lippert Components black standard replacement shock. Order: RelevanceNewestRating - High to LowRating - Low to High Replaces a standard shock to improve your ride. It has been a year now and these shocks are still doing an excellent job. Great product! I spoke with my contact at Lippert and he said the measurement of 12" extended and 7.5" compressed are measured from center of mounting area to center of mounting area. I'm not exactly sure what you are asking; if it is about how to mount the Lippert shocks, the figure you referenced is simply a part of those directions. If you would like to clarify please let me know so I can get a better idea of what you are trying to accomplish. We might have what you need, but you will need to measure the shocks on your trailer first to be certain. The Lippert Standard Shock part # LC283271 might be what you need. It measures 7.5" compressed and 12" extended. If this would fit your trailer you would need to order a quantity of two to replace the shocks on both sides of your trailer. These shocks use vertical posts so that would need to match up to what is on your trailer as well. Most likely you have Lippert shocks on your trailer and the correct replacement would be part # LC283271. This shock measures 7.5 inches compressed and 12 inches extended. Or if the shock is yellow and measures 8.625 inches compressed and 13.5 inches extended you would need the part # LC283280. I can't find the length of the shock you are replacing, but we have a couple options that may work. The Lippert Components Standard Replacement Shock - Black # LC283271, has a 7.5 inch compressed length and a 12 inch extended length. The Lippert Components Heavy-Duty Replacement Shock - Yellow, # LC283280, has a compressed length of 8.625 inches and an extended length of 13.5 inches. We also have some brake actuator shock absorbers like # T2336200 with a shorter length. We have the Nev-R-Lube Hub and Drum Assembly # 8-389-81UC3 that is for 8,000 pound axles. The hub is an 8 on 6-1/2 bolt pattern and uses 9/16 inch drive-in studs that are included. For replacement shocks you're going to want to measure your current ones to make sure you find the correct size. Our Lippert Components Replacement Shock # LC283271 measures 7-1/2 inches when compressed and 12 inches when extended. See the video I've attached for the correct way to measure shocks. Lippert Components Heavy-Duty Replacement Shock - Yellow # LC283280 are what you will need as replacement shocks. They are 8.625 inches completely compressed and 13.5 inches completely extended so under weight they likely will be right at your 11 inch measurement. If you need replacement brackets, you can use the kit # LC281281. In order to determine if the Lippert Replacement Shock # LC283271 will fit your 2001 Thor Wanderer, you will need to remove one of its current shocks and take a measurement. If it has a compressed length of 7-1/2" and an extended length of 12", the Lippert shock will fit. We do have a kit that will work with your 6,000 lb axle with your length of springs. The Dexter Heavy Duty Suspension Upgrade Kit # K71-358-00 uses 1/2" thick steel shackle straps though would not be compatible with Never Fail bushings because the kit includes wet bolts cannot be used with Never Fail Bushings. Please keep in mind that for a tandem axle you are going to need two of these kits. I've added a link to a video review of the kit for you to take a look at. You will tighten the hardware for shock # LC283271 until the rubber grommets have the same diameter as the washers. They are close to the same diameter to begin with so be careful not to overtighten them. The Lippert Components Shock # LC283271 is a replacement part. Although it works well, if you don't have the mounting hardware already, this shock alone will do you no good. Instead what you want is a whole shock kit. Since you have 3,500 lb axles, which are typically 2-3/8" round, you will need the kit # LC281255. This includes the shocks and the mounting hardware. This kit has a weight capacity right at the 3,500 lb mark. What is the Weight Capacity of the Lippert Components Replacement Shock? We might have what you need, but you will need to measure the shocks on your trailer first to be certain. The Lippert Standard Shock part # LC283271 might be what you need. It measures 7.5" compressed and 12" extended. If this would fit your trailer you would need to order a quantity of four to replace the shocks on both sides of your trailer. These shocks use vertical posts so that would need to match up to what is on your trailer as well.